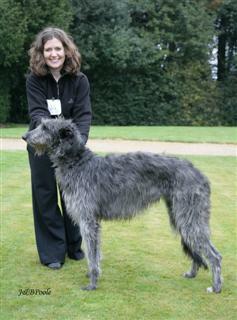 What a beautiful Deerhound and it looks like she can really move. 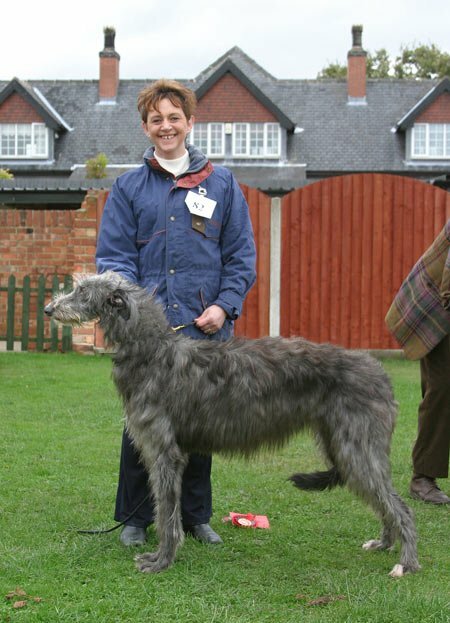 How is she bred? 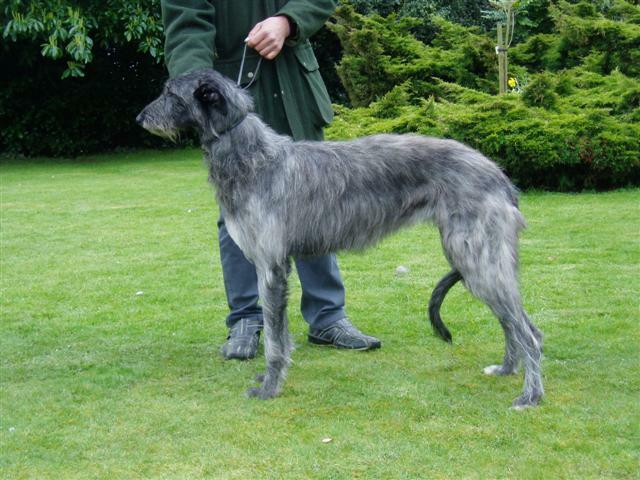 Bree comes from the now Australian kennels of Jacobite and has strong Kilbourne and Atlas lines with a bit of Ardkinglas thrown in for good measure. 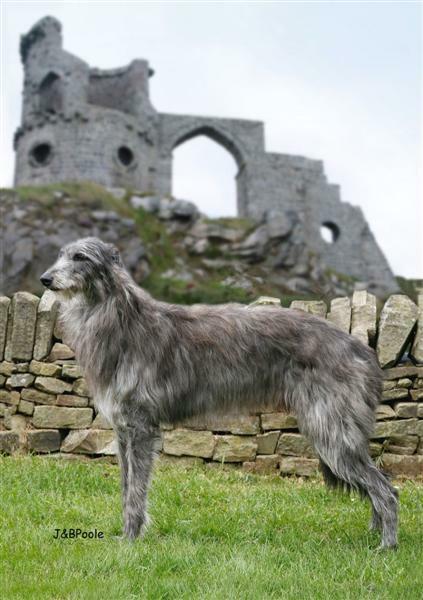 Anduril Ravenscraig on the stack at 7 months - A-framing a bit! Last Edit: 10 years 9 months ago by Fyrth. Well here's some of mine. 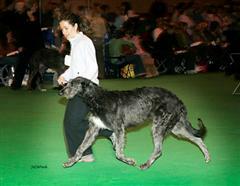 This is Drawing Down the Moon to Cusidh (or Banrigh) at Crufts in 2006. 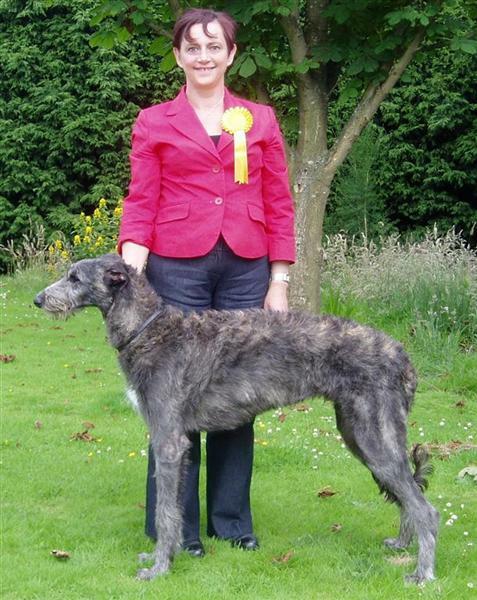 Banrigh is a girl - I blame my Mum for her desire for unusual Scottish Names! You can never tell from the name if they're boys/girls unless you have studied Gaelic. I haven't, so I also have an unusual take on the pronunciation as well. However, I agree she's stunning. She'll be four this December. I'll post up a recent picture of younger her sister (from a repeat mating) too. 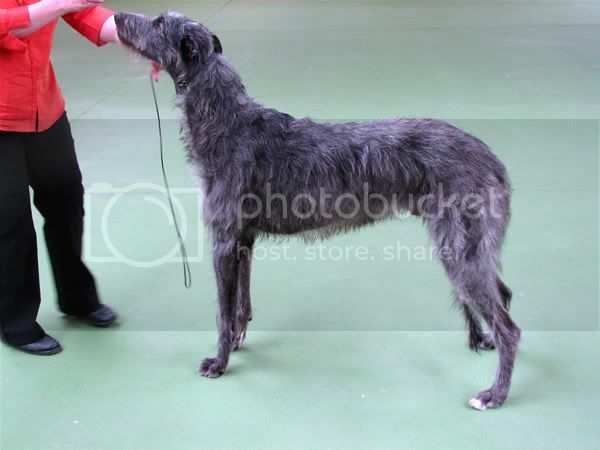 Here's Dream Dance for Cusidh (or Kee-Kee) she's just 2 years old. 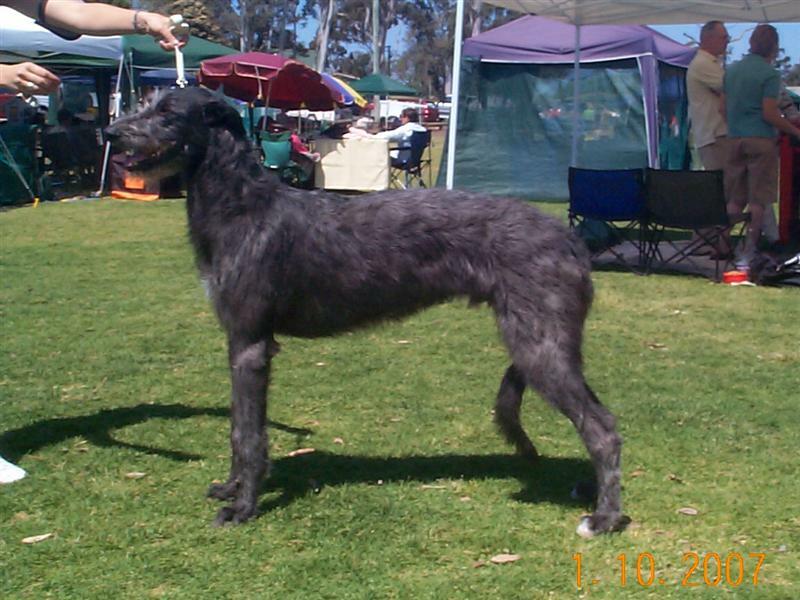 This is a picture of her at this year's breed show. She's lovely too. I need to work on showing and standing her a bit better but we're hoping she'll do well. They are both beautiful girls, their mum and dad obviously made a good combo! 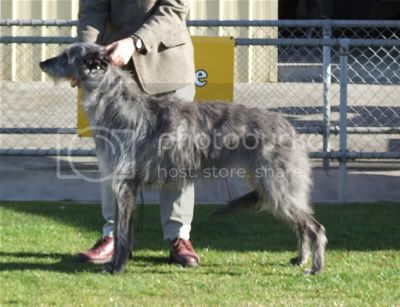 One of Taog at the Hound club show at 9 months where he won RuBIB. 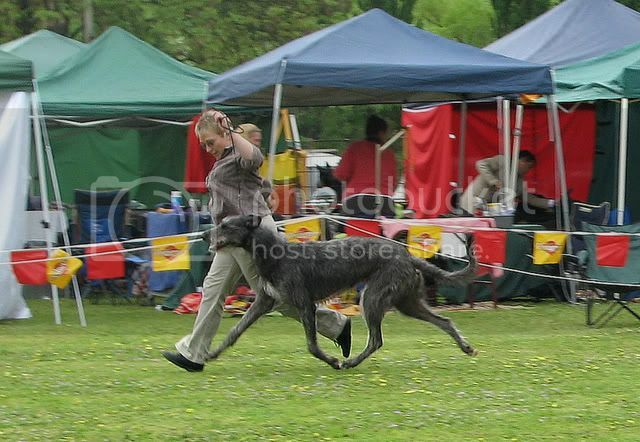 Will have to try take some more up to date ones next show. I'd love to see a recent one. 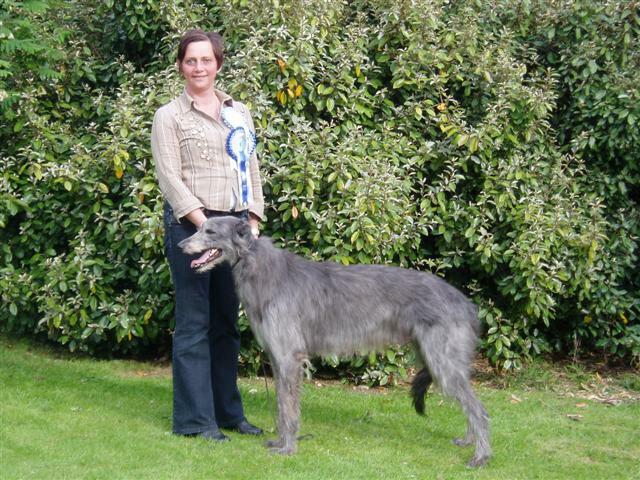 I wish Terry would get a bit more trigger happy with the camera "sigh"
Killoeter Girzie at Claonaiglen. Ch. Claonaiglen Orrins dam. 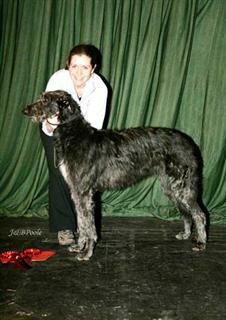 Brackenford Dalesman at Claonaiglen, Orrins sire. This photo was taken at Birmingham National Champ. Show. (The castle isn't really there). Oop's. meant to send this one. 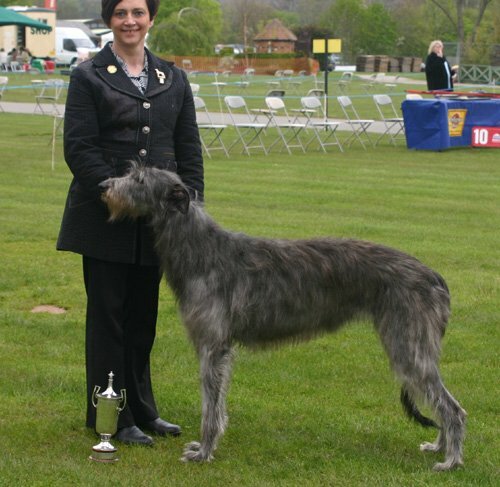 Claonaiglen Mallie, Deerhound Club Breed Show 2008. 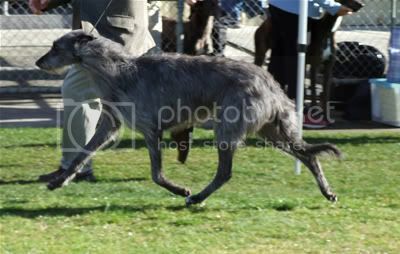 Claonaiglen Finnan, Orrin's son, making his debut at Evesham Open show last week.